The Eagle Doesn't Capture Flies! 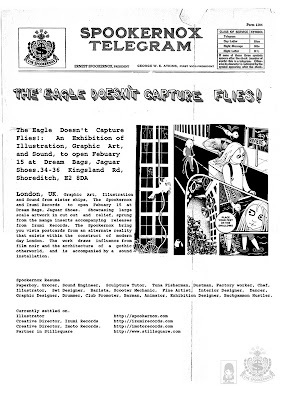 : An exhibition of Illustration, Graphic Art and Sound opening this evening, Thursday 15th at Dream Bags, Jaguar Shoes. Dream Bags, Jaguar Shoes. 34-36 Kingland Road, Shoreditch.